For the longest time I’ve wanted some leather trousers. Not having the average European body is always a problem when looking for clothes in certain shops. Having fallen in love with these leather coated trousers from Zara I was pretty upset when my fat thighs didn’t allow the trousers to sit on my waist properly. After a lot of searching I found a cheap and cheerful pair of pants. 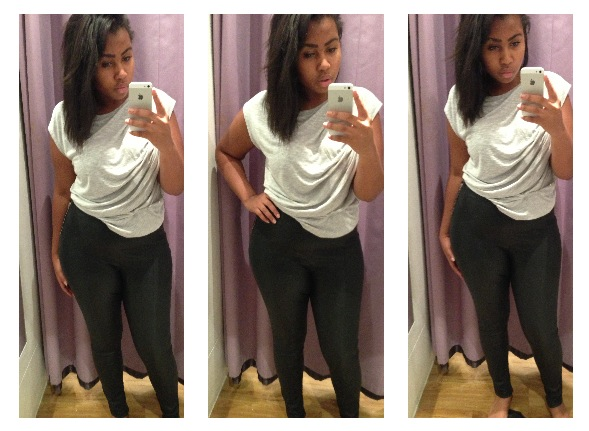 These leather trousers from Primark came in at £15. However, the trousers didn’t have the skin tight effect that I wanted. But I would definitely tell you to try them out, they are super comfy but just aren’t clingy enough for me. But the best has to be from Topshop. Although they are actually leggings they look like leather pants. Although they cost more than the Primark pair and aren’t as comfy they are just how I wanted them. Tell me what you think of them and if you have brought any recently and where, I would love to know your thoughts are on today’s post. Random Fact: I met Trey Songz earlier this year and he smells so good (I told him). Previous Post Shoes Shoes Shoes. Next Post Tartan Glory: Autumn Trends.